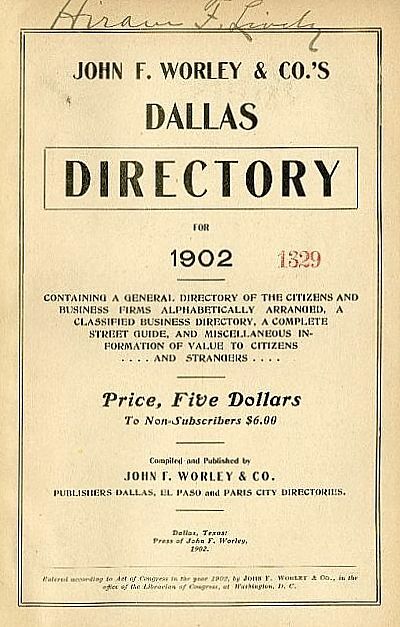 A couple of months ago I wrote the post “How to Access Historical Dallas City Directories Online,” which was, mainly, to give instructions on how to view, for free, scanned city directories from the years 1875 to 1979 online, via the Dallas Public Library website — all that is needed is a current library card issued in the city of Dallas. Last night, I stumbled across twenty of these Dallas directories on the Portal to Texas History site, issued in various years between 1902 and 1961, scanned in their entirety by the Dallas Public Library. Ironically, several of these scans are far superior to the ones viewable on the Dallas Public Library website (scans which come from HeritageQuest, a database offered to libraries nationally). Many of those scans are, frustratingly, only partial — especially concerning the years 1936-1943; the scans on the Portal site come from directories in the collection of the Dallas Public Library, and they are complete. I’m know I see these things from a nerdy perspective, but this is very exciting! I’ve updated my post linked above, but to see the 20 Dallas directories (complete with residential and business listings, street directories, and ads), you can find them here. Thank you, Dallas Public Library for the full scans, and thank you, University of North Texas for providing them to the public for free on your becoming-more-indispensable-by-the-day Portal to Texas History website and database!